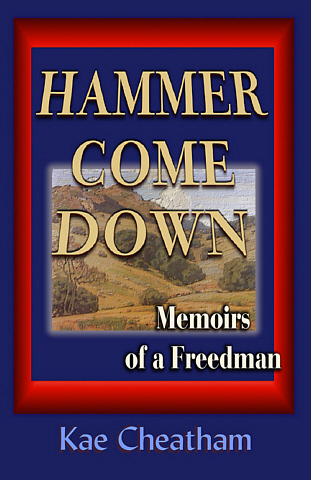 Told in first person, Hammer Comes Down: Memoirs of a Freedman depicts the atypical life of Jason, manservant to Tolin Cobb. Cobb's family developed a small plantation in Alabama in the 1810s; Jason was born there. The 1836 Creek Indian war changes the lives of the two young men when the Alabama plantation is destroyed. Devastated by the loss of family and friends, the slave, Jason, heads West with his master. During the trek, Jason contemplates his atypical life as Tolin's manservant. He has grown up knowing well the restraints demanded of a black man, yet always dreams of freedom. It is a mysterious concept to Jason, and he continually tries to define it. In the west, Jason survives various adventures at Fort Laramie, in Independence, Missouri, and in Indian Territory; each shows him different levels of freedom. Through a generous dollop of fate, Jason even finds his true love who had been missing since the Alabama war, making the freedom he attains much more complete than anything he imagined. Tense, dramatic and historically accurate, Hammer Comes Down records Jason's persistent desire for freedom, and his unique friendship with his one-time master, Tolin Cobb. Hammer Come Down contains a storyline and elements from the Young Adult book, Bring Home the Ghost, published in 1980 by Harcourt Brace Jovanovich. When the book went out-of-print in 1983, I was greatly disappointed. Finally, in 2012, I took the initiative to remodel the book for an adult market. My research for this book has been amplified by continued years of study of early Western expansion. Often the facts and events are directly related to occurences in the East, and accurate information about blacks in the West, although greatly improved from thirty years ago, are still hard to find. From various obscure details, I have extrapolated the background for this book and also gathered information from by visiting the locales of the story. I hope this unique view will inspire a greater interest and offer a broader scope of American and African-American history. "FORGOTTEN TRAILBLAZERS Blacks in the West (1820 - 1855)" is a presentation I developed from my research. Click here for more information about this and other presentations.